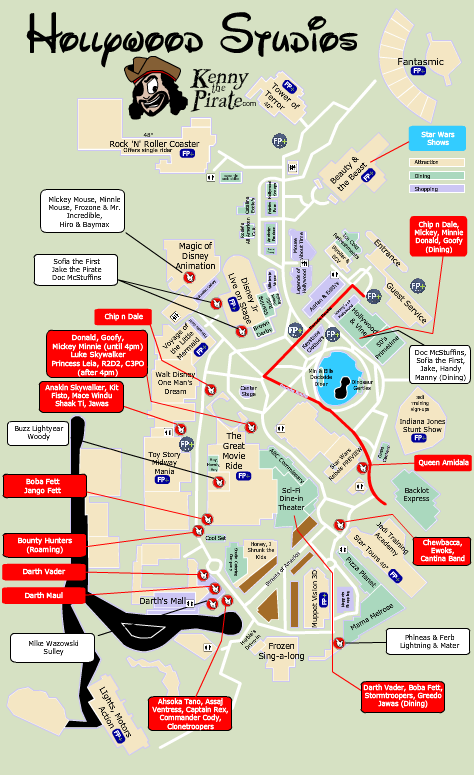 NOTE: All the regular Hollywood Studios DO continue to meet during Star Wars Weekends. The Disney classic characters that usually meet near Center Stage, wear costumes for Star Wars Weekends for special meets, except Pluto. If you aren’t familiar with the Star Wars Characters, you might want to check out my Star Wars Weekends Characters for Dummies information. The wait times next to the meet area are based on historical observation during the busiest times of the day. Lining up early for meets reduces waits. All schedules are included in my Character Locator app. The schedules are built on the first day of the event and updated as needed. It’s the only source for full Star Wars Weekends character schedules. New information coming soon. Enjoy the new map! 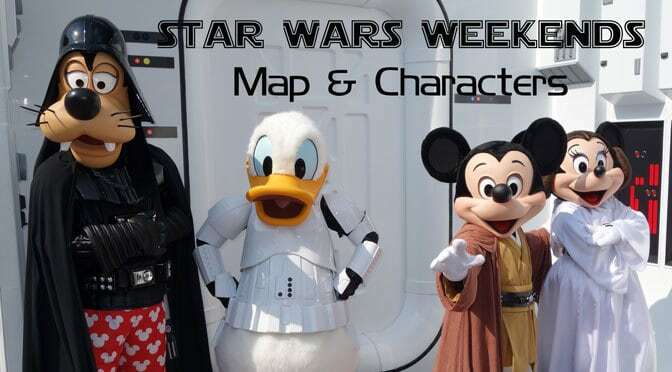 Subscribe to Character Locator for full Star Wars Weekends schedules! Hi, can DAS be used for Merida’s meet and greet? We won’t be available at rope drop to see her, yet she is a must see for my daughter. Is there any other time that’s better than others in the day or are we stuck with a long line no matter what? We’re doing MNSSHP as well but I don’t want to miss party time unless the line is going to be 30+ mins during the normal park day. Advice? Thank you for the site and all your wonderful info! In the note section…what does DO mean in the sentence about regular DO still happening during Star Wars weekends? Every SWW character, location and schedule is listed on http://www.characterlocator.com. I update it each year. At the top of this page you list “Roaming Bounty Hunters” in the low priority section. I assume they are different then Boba and Jango Fett. Do you know who they are, what they looked like or what era they are? Thank you again for your continuous help! Yes, that would be Aurra Sing, Gamorrean Guard and such. That’s why the Fett’s are listed separately. They offer a fixed location meet and rotate. Crowds were crazy low because they blocked Cast Members and their guests today. Nice day to be in the park. You’re very welcome! It was terrible because they only blocked us out last week, not two months in advance like always. But they lifted blockouts for Magic Kingdom, so we can go for the first time in forever!!! Glad you guys get to go to the parks, it’s a bummer when they block on that short of notice. I noticed that one Ewok’s location is listed as Speeder Bike (like Chewie) and the other is listed as Star Tours Area (like Cantina Band). Is there one in both spots or is the only way to meet them in Chewie’s afternoon line? Just realized the character list this year and once again they havnt changed anything!very sad the SAME characters every Star Wars year and its insane how they cant bring out some new charaters like the emperor,greedo,the royal guards.I wish disney can read this post because there are people out there that know wht they are doing and refuses to bring there family to the same event every year! Greedo appeared last year. He’s at the star wars breakfast this year. It looks like C-3PO appears 3 times for just 15 minutes each. Am I reading this correctly? I’ve been to WDW several times, but never been big on the Meet and Greets. However, I am a big Star Wars fan and am hoping to get a pic with 3PO and R2. Fortunately, I got the SW breakfast and dinner packages as well as the Feel the Force package for weekend 5, so I will get to see several SW characters. Thanks in advance! That’s all I could find for him. I’ll check again next week to see if it changes. Is R2MK greeting with the Mickey gang again this year? Hope you had a great first SWW!! Abseloutely no cast members at the hat or in Animation knew where Daisy, Pluto, Lilo and Stitch were relocated. Yes, a character attendant and the My Disney Experience informed me that Lilo was added to the Hat character group. One character attendant at Wreck-It Ralph’s meet said that their friends were being used for Star Wars Weekends and were not appearing for SWW. Mr. Penguin was no where to be found either. Am I remembering correctly that all SW characters will sign except the droids? Are the meet times listed here for this year, or will those not be available until the first weekend begins (similar to last year)? Thanks. Not sure if that means you will be hunting for set times on the first Friday of SWW or not, but I’ll be there and I’d be happy to help out and give back to this site since it’s helped me countless times. Rob. Sorry, didn’t mean to confuse you. I usually spend the whole first friday running around trying to figure out set times. I’d love to have help if you’re willing. Send me an email! For the ones in backlot area do you actually have to go on ride to see them? When do you think you will have the 2014 SWW character map available? Will it not be until after the first weekend? Thanks. The map lists “Penguins” inside Animation. Is Mr. Penguin moving inside there for Star Wars Weekends? I think you meant Stitch unless he is becoming a new SWW character. Mr Penguin was there during SWW last year. Darth Mall isn’t by Rock n Roller Coaster in 2014? Thanks for the update! I would have been lost. Nope, they are moving it. Rumors say that Mickey and the Gang may move in it and they may move the Luke/Leia etc near Star Tours. Hi Kenny, your historical SWW information really helped us a lot when I took my 7 yr old son over weekend #1! This might be a no brainer, but every time I asked when a character would come back out, the CM took out a little folded up cheat card, and referred to it. I asked if I could have one, and was turned down, but if you could befriend someone willing to pass it along to you, you would be golden in a heartbeat, just sayin’! Wish I had your parade advice Day 1, it was tough to see the procession or the stage from where we ended up, across the way from AI, in a huge crowd. But on Day 2, we walked up to an open corner at the bottom of Hollywood Blvd, only 10 min ahead, across the street from where they come out of the gate. It was a perfect vantage point to see every single participant come out of the gate and make a turn onto Hollywood Blvd! Then we simply followed the procession up the street, and saw the stage from the middle of the street. Yes, we stood in the blazing sun, but only for about 20 minutes (10:50-11:10), not too bad, and then we … moved along. The same info that’s on those cheat sheets is on my Star Wars schedules here on the blog and on http://www.characterlocator.com :) What you see right now isn’t historical, its 2013. Thanks for the compliment and glad you had a great trip! Yes, but it WAS historical 2012 info on May 15th when I left for Disney, lol! I mentioned the cheat card because I remember you asking for help reporting character times, by asking for tweets of the times provided by the CMs at each meet. Maybe I was mistaken, but I figured the card gives ALL the info in one fell swoop. Thanks for the quick reply! Oh, yes. It sure was then. They totally changed the schedules. I updated them on the 17th and 18th. Some CMs have only their meet on the card and a few captains or managers may have the full schedule. It’s funny because some of the CMs have the cards hand written. The only schedule I wasn’t able to fully complete was the Mickey, Minnie, Donald & Goofy afternoon sets. I had to observe those rotations and I got busy with other things each afternoon :) I don’t think the CM allows anyone to take a photo of the card. That’s why you need to make BFFs with a captain CM, haha! Hi kenny long time no talk.I been so busy down here in ny working from storm sandy.I havnt seen u since last year the week of the marathons and that crazy jack and sally line we waited on downtown disney.my wife is prob signing up for the tower of terror marathon and i was wondering do u thk any new rare characters will be out.Also my son and i love greedo and are u saying he might go this year to sw weekend..cuz its been the same party everyyear for the last 3 and they need new characters? Thanks so much Kenny. This is so helpful to my family. If my kids (8, 6) wanted to get their picture with every single character involved in SWW (not celebrities though, thank goodness), is it possible to do that in 2 full days, if we don’t go on any rides? They are huge Star Wars fans. We got everyone except Leia and Mace in a day and a half and we did go on rides, so two days should be good! Thank you for all your hard work, Kenny! You rock! Do these schedules apply for all of the SWW or only this weekend? We will be there for the last one on June 7. Everything is subject to change, but it should make a good guide at least. Thanks so much for all of the hard work you do. Are these the full schedules, or just what you were able to learn on Day 1? I assume with you there this weekend that you will clue us in to the schedule the Star Wars characters are keeping to. You’re site is so helpful. Leave in less than 3 weeks. My DD’s #1 on list for pictures are Jedi Mickey and the gang; Chewbacca and Ewok; Luke, Leia, C3P0, and R2D2, and then Darth Vader. Hoping to get them all seen in the one day. If you have advice on which order is best to try to see them and/or time of day, I would appreciate the advice! You are awesome doing this! I know it takes a lot of work on your part! Appreciate all you do to help the rest of us have a spectacular vacation! You’re welcome. I’m working on the update right now.